I am so loving the Moreheads at the moment. Two cards are from the Moreheads cd rom shaped cards. 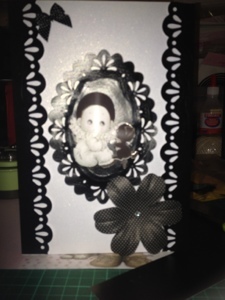 The little piroet is a Morehead decoupage sheet and the white card is the white pearlised card the borders and centre piece is cut with borders 4 and oval desire dies new at crafters companion and cut on black pearlised card added a black dotty ribbon and a papermania large black dotty paper flower and white gem. Three great cards - hard to choose which one I like best. 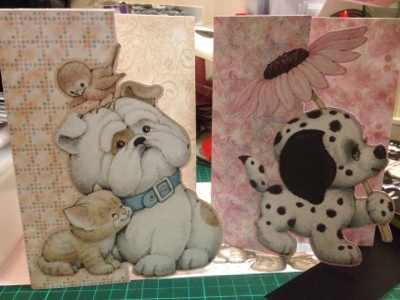 Stunning cards I too love the Moreheads as does my mum. I love the morehead images as well :-) do cute and so sweet you just fall in love with them! These are fantastic, think I might try the shaped cards tomorrow...you have inspired me.